The Wizarding World returns to LEGO®! 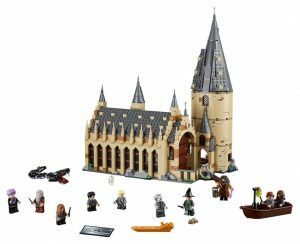 The LEGO® Group has sent out a press release announcing new sets based on the Wizarding World, including sets from Harry Potter and Fantastic Beasts. In today’s announcement, LEGO® shares an image and details of the upcoming set, LEGO® Harry Potter Hogwarts™ Great Hall. This set will retail for $99.99 in the US and will be available August 1st. My youngest daughter started watching the Harry Potter movies again, so it is exciting to see the rumored sets showing up. Now, I think that Fantastic Beasts was better than any of the Harry Potter movies, but that doesn’t curb any excitement I have over these new sets. It will be fun to see what else LEGO® has for us as the New York Toy Fair kicks off this weekend. More images will be coming out showing off these new sets, as well as the other sets that LEGO® has for us this year! The full press release from LEGO® on Hogwarts Great Hall is below. Build and recreate magical scenes from the Harry Potter movies with this detailed 4-level LEGO® Hogwarts Great Hall play set, featuring a fireplace, benches, tables and reversible house banners, plus a tower with a spiral staircase, potions room, treasure room, sorting hat, Mirror of Erised and lots of assorted magical artefact accessory elements. Includes 10 minifigures and buildable Basilisk and Fawkes creatures, plus Hedwig and Scabbers figures.